Let me be up front, just like Rocket Raccoon. This Guardians of the Galaxy, Vol. 2 review is not going to be as glowing as the pages and pages of reviews out there. It’s a rollicking good time, but there’s so much to take in that you lose the thread of the story. If you want to find out why I’m all “meh,” keep reading. Guardians of the Galaxy, Vol. 2 begins not long after the gang defeated Ronan. They have clearly gelled into a routine, although they’re still working out some minor irritations with each other. They wouldn’t be the Guardians if they weren’t bickering. The sequel focuses on what it means to be a family even more than the original. In this case, family for Peter Quill could be Gamora, Drax, Rocket Raccoon and Groot, or it could be Ego the Living Planet, or even that blue rascal, Yondu. Marvel movies have a very successful formula. 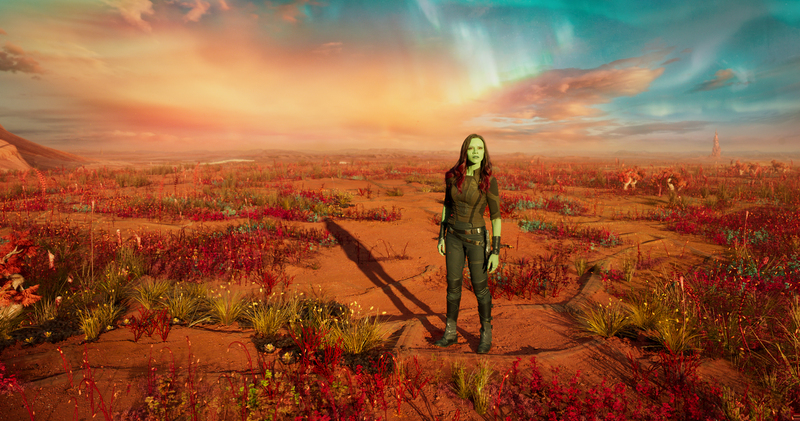 Although director James Gunn has described Guardians of the Galaxy as a space opera, akin to Star Wars, rather than a superhero film, the same formula that made Avengers work has been applied to Guardians of the Galaxy, both Vol. 1 and Vol. 2. All the ups and downs come at the right time, all the beats work rhythmically, and every single character gets their shining moment. Guardians of the Galaxy, Vol. 2 covers a lot of ground in just two hours. The beauty of Marvel is that the media company knows how to serve up complicated stories and mind-blowing explanations in digestible bites. When Ego the Living Planet describes the timeline of meeting Peter’s mom, for instance, we get some easy-to-follow visuals that match an easy-to-follow monologue. All movies set in some kind of outlandish world where people have powers require a great deal of suspension of disbelief. 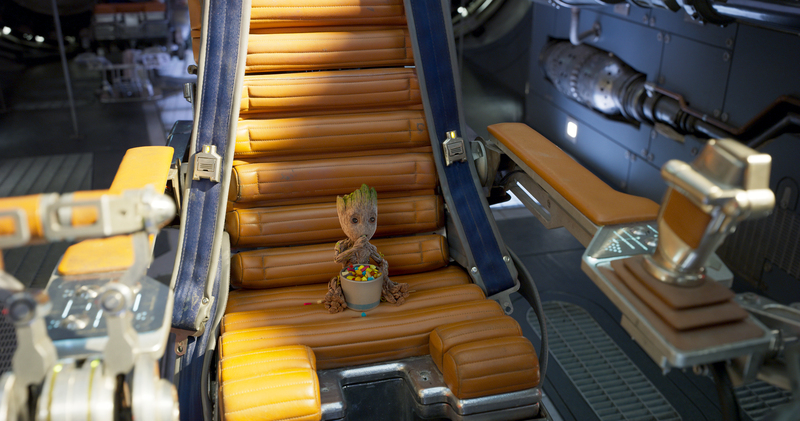 Guardians of the Galaxy movies require even more than usual. So many space things make little sense in these movies, if you think about them too hard. To keep audiences from falling into the “that would never happen” trap, the pace of Guardians of the Galaxy, Vol. 2 is super-fast, like, blink and you’ll miss something. All the actors are spot on, as usual. Each of them gets their starring moments to shine. Kurt Russell, who plays Ego the Living Planet, does a tremendous job of playing a character who is sometimes sympathetic and sometimes terrifying. The things that didn’t work in the movie are fairly minor. Like I mentioned above, Guardians of the Galaxy, Vol. 2 covered a lot of story at a quick pace, all the while giving each character their own special moment. The result, however, was that I walked out of the theater with my head spinning a bit. I had trouble remembering anything specific from the movie, because I had a general blur running through my brain. I can seize on plenty of moments, and the more I think about it, I can tease out moments that I enjoyed. Overall, I wish there had been less. When you have too many characters in a movie, which Guardians of the Galaxy, Vol. 2 does, the audience doesn’t get to spend enough time with the right people. What do I mean? 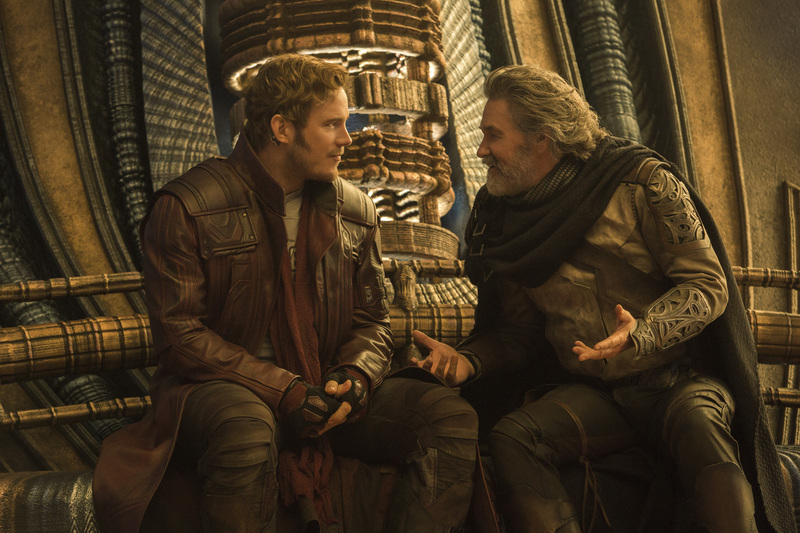 Chris Pratt is the star of the Guardians, far and away. His off-the-wall line delivery, combined with his mischievous smirk, was what made Guardians of the Galaxy, Vol. 1 different from other superhero movies. He was the glue that held together the disparate parts of the story and the cast. There’s not nearly enough of him in Vol. 2. He has a few great scenes, but the Chris Pratt concentration is far too diluted by having to cover everyone else. Not enough Star-Lord. Which characters could have been jettisoned? Mantis, for sure. 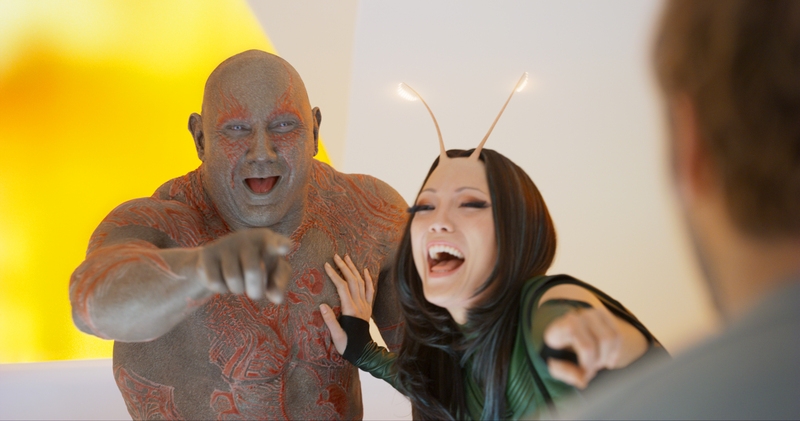 Yeah, she plays a great straight man to Drax’s shenanigans (actually, it’s hard to say who’s the straight man in that comedy duo), but she was completely unnecessary. That whole scene where she revealed what everyone already knew, that Peter was hot for Gamora, was entirely unnecessary. One could argue she was instrumental in moving the story about Ego along, but I’m confident the writers could have come up with other plot devices that wouldn’t have wasted time introducing a new character. Plus, a little Drax goes a long, long way. The Ravagers got way too much screen time, as well. Again, I understand that their mutiny played a big part in Yondu’s evolution, but he was already well on the way to becoming a better man (alien?). Gunn could have cut down on a lot of their comedic scenes and just gotten on with it. The whole “taser face” running gag was just indulgent. Let’s take a moment to talk about special effects. Now, my husband will be the first to tell you that I am dazzled by special effects. Usually, the more the better, I say. I love spectacle, so big explosions and highly choreographed action scenes make me bug out. However, Guardians of the Galaxy, Vol. 2 is so saturated with special effects, even I disconnected from the movie. At times, when the only organic things on the screen were actors, I could actually see them standing in a cavernous, green soundstage. The special effects were terribly well-executed, and gorgeous, but I could have used more practical effects and sets, and less green-screen. Guardians of the Galaxy, Vol. 2 is a fun movie. It’s even “Certified Fresh” by Rotten Tomatoes. But it’s more like a theme park ride than a story, with too many characters, too many special effects, and too little Star-Lord.